A cold white blanket of snow covers Burbclavia; we managed to get to the gathering place to celebrate the new year with family and eat yummy chili with all the extras, and the obligatory lox ‘n bagels. My nephew Josh is in town and brought his girlfriend Ashley; FIL Shel and Linda made the trek and so did my BIL Dan and his girlfriend Tammy. Mitch and Gloria put on a really nice buffet and of course Rosie the pooch princess provided entertainment. Things got raucous (or at least very loud) when Josh showed us this crazy trivia game called Face Off, where you hold a smartphone up on your forehead that shows trivia; the point is for each player to correctly guess what’s on the screen that everyone else can see. The song category was a flop because those of use who CAN sing or at least carry a tune didn’t know any Justin Bieber songs. Seriously. Justin Bieber? In a few years he’ll be Vanilla Ice with a bad combover. The carrot cake with the orange/rum/butter sauce was pretty good! It wasn’t pretty, but it tasted amazing. It’s been snowing all day and the front walk looks like David didn’t run the snowblower twice already. This weekend will be snowy and cold, and Monday the HIGH will be -8F, and it’ll get down to -15F if the forecast holds true. Wish we’d ordered the fireplace insert when we first looked at it. Damn. 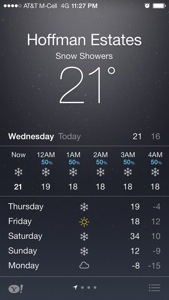 It’s even snowing on my iPhone, in a twee animation Apple has on the current version.